I am really excited by this toilet paper! I’m serious! 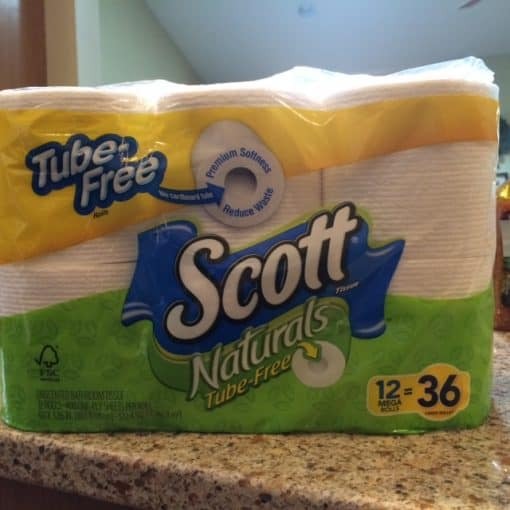 When I saw it in the store I actually said out loud (mostly under my breath), “This is so cool – tube free toilet paper! !” It is such a small change but to me those are the things that are so easy to do and can add up to such a big impact. According to the package info, “Each year 17 billion cardboard tubes are thrown away in the U.S. alone. Tube-free toilet paper can help cut down on the 160 million pounds of waste caused by those 17 billion toilet paper tubes discarded each year.” I’m sorry, but that’s a big deal!! What I didn’t realize when I bought it is that it’s also made from 40% recycled materials. So, it’s not 100% but I give it a lot of credit for being tube-free!